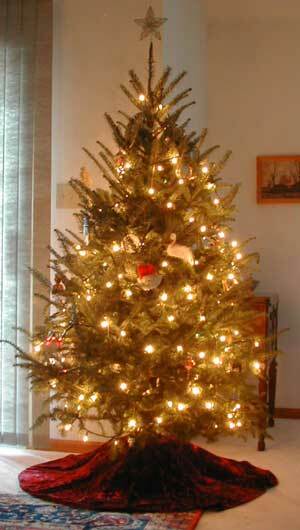 Rebecca started a thread at Crochetville asking everybody to share their Christmas tree or other holiday decoration. I’m so glad she did because I’ve enjoyed seeing everyone’s trees. Finally, here is mine. 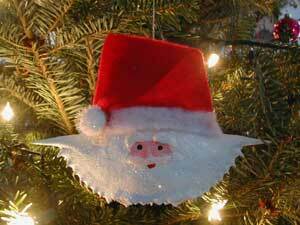 And I have to share one more ornament–my crab Santa. A few years ago, we drove out to Harker’s Island for a nice weekend day-trip and the Core Sound Decoy Festival. We stopped at Captain’s Choice Restaurant for lunch and they had a few handmade ornaments for sale hanging behind the register. My husband spied the Santa and, knowing how much I love crabs, bought it as a memento of our trip. You see, except for the hat added at the top, it is actually a crab shell, painted and glittered. Cute cute crab Santa!! I’ve seen them painted before but not a Santa one! :) Your tree is beautiful!! Gorgeous Xmas tree. The crab santa is just too cute. Greetings from Beaufort! I love the crab santas too! I wish I didn’t put away our tree yesterday. :o( The crab Santa is so cute!